It's been a busy start to the season with a huge jump in enquiries, it seems that a lot of people are excited at the whole skibike concept but are unsure about exactly where to go and what will be allowed. France is the closest skibiking nation to the UK, but unlike Austria, where you can go skibiking just about anywhere with minimum interference, this is not yet the case in France. Do the French still hate skibikers? France used to be skibike friendly in the 1970s, but hooligan behaviour and the resulting high profile crashes changed their attitude. It took 40 years of diplomacy to get allowed back out on the slopes, first on skibobs and more recently on freestyle skibikes too. 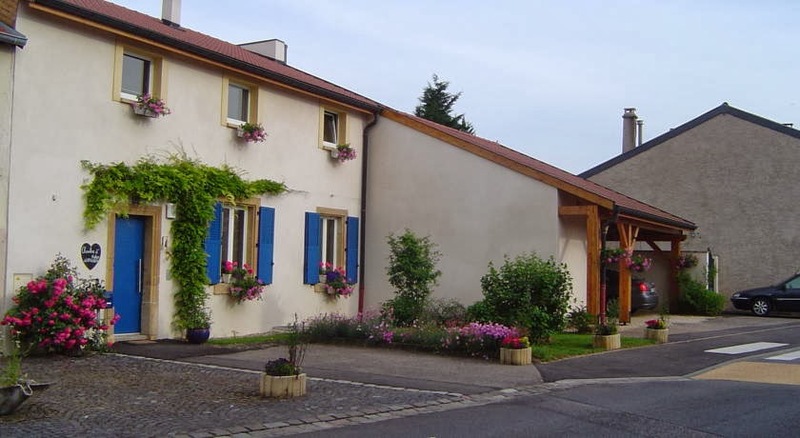 A resort may market itself as the "Grand Valley" this or "Super Big" that, but behind all the corporate glitz are many disparate organisations that all have to be in agreement before skibikers are let loose on their domain. The actual mountain is normally the property of individual farming villages, controlled under the supervision of their mayor. Unlike the situation in other countries, in France, the ultimate responsibility for safety stops with the mayor. An extreme example of "the buck stops here" attitude came after a fire in the Mont Blanc tunnel which saw the Mayor of Chamonix in court as a defendant. With this in mind, you may better understand why some areas find it easier to say "Non" rather than "Oui" to skibikes. 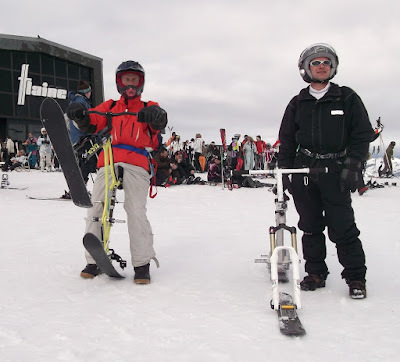 The French skibob club organised written agreements with various resorts to simplify the process of finding a skibike friendly resort to ride at. Unfortunately they organised it in such a way that it doesn't include freestyle skibikes, indeed some agreements are exclusively for Brenter riders only. As a freestyle skibike rider you are more likely to find the most up to date information here. The second block to getting skibikes on the mountain, is the company that runs the lift network, once again there is often more than one company involved and they all need to agree on safe practices for carrying skibikes on their network. The very first lift systems were constructed for the benefit of skiers and not for foot passengers wanting a lift up the hill to go for a stroll or visit a mountain restaurant. Therefore, the rules specified that to use a chairlift you had to be able to slide on and off. The first skibikers got around the tight regulations by wearing tiny skis on their feet, these so called footskis allowed them to ski off the chairlifts or even use drag lifts, just like any skier would. The concept of freestyle skibiers walking onto lifts in high grip footwear and carrying a skibike as a piece of "luggage" is a novel one, especially in France's most chic and snobby resorts, some of which openly regret letting the snowboard brigade in, let alone these new veloski upstarts. 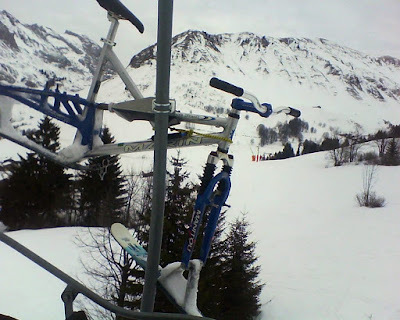 Some of the more forward looking (or cash strapped) resorts have started to change their ways and allow freestyle skibikers to use the chairlifts, there's even the odd place that is keeping the brackets on the chair more normally used for downhill mountain bikes in the Summer season. Just about all these places will want you to wear a tether or leash between yourself and the skibike. This is in order to keep the risk of dropping a skibike onto the unsuspecting heads those below to the absolute minimum. Such leashes are cheap and readily available for Snowscoot or Kayak use from on-line retailers. I wouldn't recommend using them whilst riding though, as they are more likely to cause injury in a crash and to this day I have never ended uphill of my skibike, following an unscheduled involuntary dismount. The final block to getting your skibike on the mountain in France is whether you have the correct type approval certificate or AVEL. The AVEL system is maintained by the Service Technique des Remontées Mécaniques et des Transports Guidés, which is the organisation that represents all of the lift operating companies in France and is more commonly known by its acronym STRMTG. One of the STRMTG's many administrative tasks, is to maintain a type approval system for "baggage" that covers not only skibikes, but a huge range of both summer and winter mountain toys. The precise method by which one obtains AVEL certification remains a mystery to me and my friends who have managed to get one for their particular flavour of skibike are usually tight lipped on the subject. I can but assume that in the manner of all bureaucracy, it is a question of form filling (in French) and payment (in Euros). 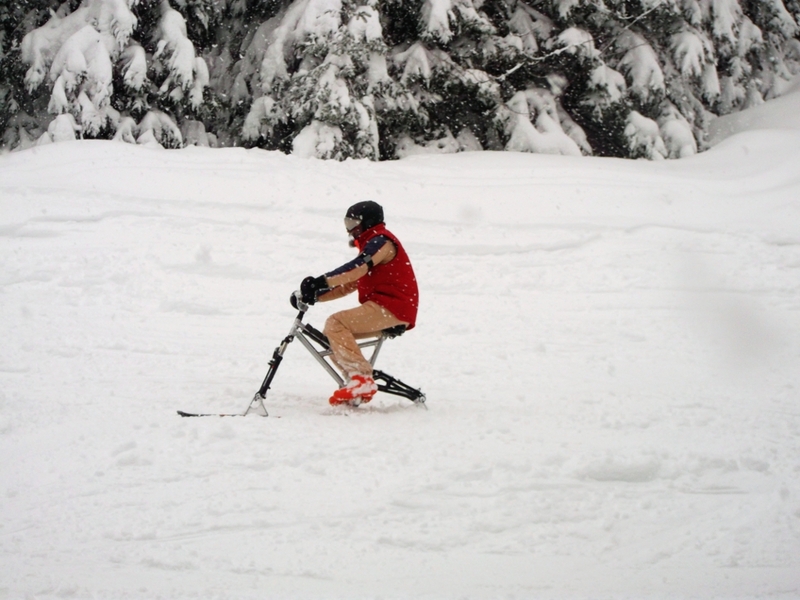 Note that there are also a couple of ski trikes and lots of SnowScoot models on the list too. The full list in pdf format is available from the STRMTG website, as the name and location of this list changes from year to year, drop me a line, if you would like to know where to find the current one. Furthermore, it would appear that once a skibike is on the list, it is automatically included on the following year's publication. 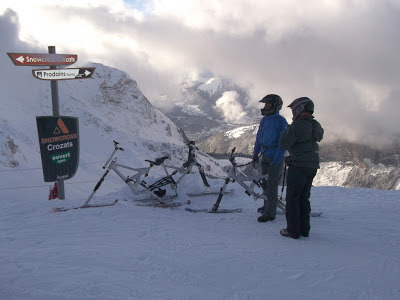 Some of the smaller resorts don't check for a skibike's AVEL certificate, but it is much more likely in the large expensive resorts; it has happened to me in both Super Morzine and Tignes. For this reason, I can't recommend you take a totally homebuilt DIY skibike to France no matter how good your engineering skills. However taking a mountain bike converted using the kit from one of the companies listed above AND bearing the correct number on a sticker should be fine. It also helps to disguise the origins of your skibike conversion, by removing all the original bike stickers and making it look as little home-made as is feasible. 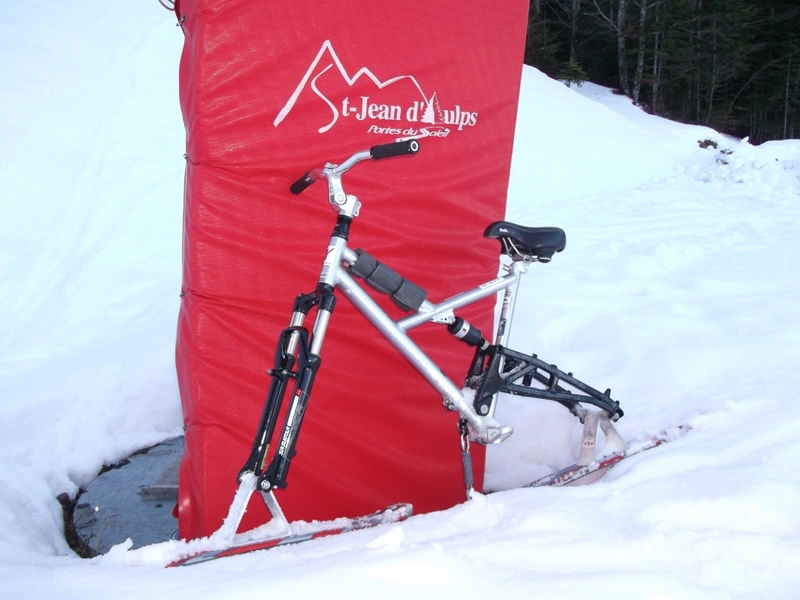 Given the ready availability of excellent aluminium frames for pocket money prices on auction sites, there is a lot to be said for creating a dedicated winter skibike. If I wasn't such a Francophile it would be a lot easier to join the majority of other European skibikers and head for the Austrian Tirol. But in spite of it's many challenges, like a long pursued and hard won lover, France does have many rewards to offer, not least being a choice of 5 disparate mountain chains to play on. France has closest big mountains to the UK, if you live South of Coventry you can be in the French Alps in less time than it takes to get to Cairngorm in Scotland. Each year skibiking in France gets easier and more accepted, let's hope that trend continues as more novice skibikers head there to put in their first turns.